Blue Ridge Mountain Tomato Plant : Tall potato-leaf vines bearing , large, 1 lb., 4-inch, pink beefsteaks with good old-fashioned, delicious tomato flavor. Brandywine Pink Tomato Plant : Very large, reddish, pink fruits averaging between sixteen and twenty four ounces each. The large potato leafed indeterminate plant produce an abundance of fruit with that perfect tomato taste. The fruit tend to vary from round to boat shape. Brandywine Pink is a Pennsylvania old Amish beefsteak heirloom tomato dating back to 1885. Considered by many to be the best-tasting tomato in the world. German Johnson Tomato Plant : A large, prolific plant originating in Virginia and North Carolina that produces huge, pink, beefsteak type tomatoes often more than 1-pound. The flavor is excellent. Thought to be one of the four parent lines of "Radiator Charlie's Mortgage Lifter." A wonderful tomato. 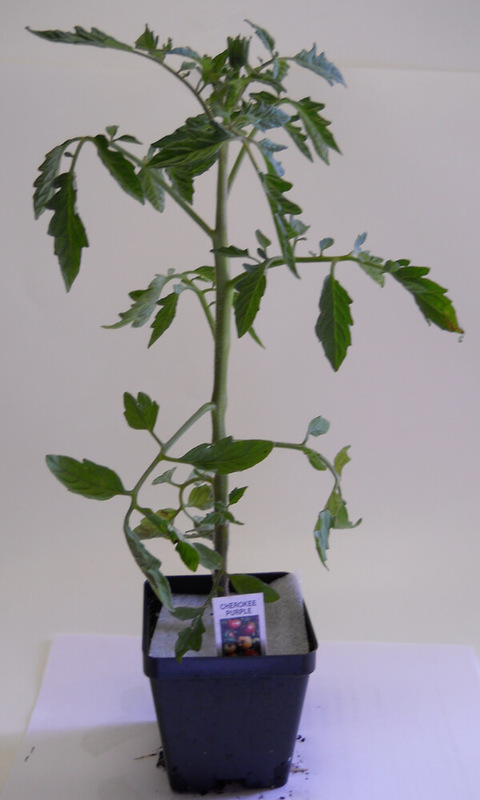 German Queen Tomato Plant : Very popular heirloom variety most renown for it's full, rich flavor. Very big potato leaf plants produce lots of sweet, pink, 1-2 lb., meaty, beefsteak tomatoes. Perfect for slicing. Grandfather Ashlock Tomato Plant : One of three Ashlock brothers who served George Washington during the Revolutionary War settled in Kentucky. Carl Ashlock, now of Franklin, North Carolina, is descended from that patriot. Carl and his father and grandfather farmed in Kentucky in the 1920's, however, where they grew a large, pink, tomato variety, the seed of which, Carl shared with a few tomato growers. This heirloom plant produces large potato-leaf tomato plants that yield exceptionally delicious, 12-16 oz., pink, beefsteak tomatoes with a sweet, well-balanced taste. Rare tomato variety.